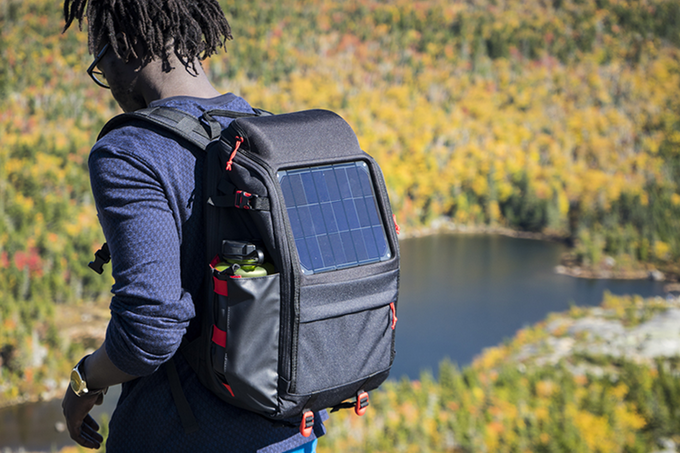 Voltaic has launched two new backpacks on Kickstarter, the Array and Offgrid. Both models feature integrated solar panels and removable batteries that charge when the bag is in sunlight. The Offgrid model is the smaller of the two, featuring a 6W solar panel and a 4,000mAh battery, while the Array has a larger 10W solar panel and a 19,800mAh battery. Both batteries can be removed and charged using a wall outlet, as well. The Array model includes Voltaic’s V72 Universal Laptop Battery with selectable 12V, 16V, and 19V options for charging ordinary laptops. It also has a USB port for charging USB devices. The battery takes 12 hours to charge via solar or 4 hours to charge from a wall outlet, and it is suitable for charging a DSLR camera between 3 and 6.5 times, a tablet 2.5 to 3 times, a drone one time, a laptop up to 1.7 times, or a smartphone between 4.5 and 8 times. The Offgrid bag model is for less demanding devices, featuring a V15 Universal USB Battery with a 5V/1A output. This battery takes 4.5 hours to charge in the sun or 4 hours to charge from USB, and it can recharge a DSLR between 0.7 and 1.5 times. If that’s not substantial enough, however, Voltaic also offers a V44 12,000mAh battery upgrade, enabling it to charge a DSLR between 2 and 4.5 times. Voltaic is seeking funding for the bags on Kickstarter, where it offers the Offgrid as an early bird unit for pledges $119 or higher, and an early bird Array for pledges of $219 or more. The company anticipates the early bird models shipping to backers this December, while non-early bird models are estimated to start shipping in March 2017.